Every week we pull together some great Canadian recipes from Canadian food bloggers around the web featuring one main ingredient or dish. This week, we take a look at our favourite carb - bread! It's the bookends for a great sandwich from PB&J to the classic grilled cheese. It brings back vivid memories of family and childhood. It has limitless variations and add-ins. It's perfection toasted with a swipe of butter. So we have gathered 25 Canadian food blogger bread recipes for you to enjoy and try at home! If making bread makes you nervous, be sure to check out our introductory bread recipe that demystifies the process! 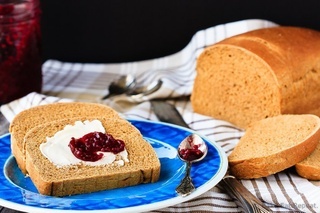 This slightly sweet, soft **[Icelandic Brown Bread](http://bakeeatrepeat.ca/icelandic-brown-bread-recipe/)** is a perfect morning toast or sandwich bread. From **Bake Eat Repeat**. We can't hear the words **[Marble Rye](http://climbeatcyclerepeat.com/marbled-rye-sandwich-bread/)** without thinking of Seinfeld. You won't need to steal any loaves from old ladies on the street with this recipe to make your own! From **Climb Eat Cycle Repeat**. Making your own **[Whole Wheat Sourdough Bread](http://joybileefarm.com/sourdough-bread-recipe/)** doesn't have to be hard but it can take time. Here's everything you need to know - including making your own starter! From **Joybilee Farm**. Delicious pretzel dough turned into **[Pretzel Bread Buns](http://joandsue.blogspot.ca/2014/02/pretzel-bread-and-pretzel-bread-grilled.html)**. Can you just eat one? From **Jo and Sue**. **[Pain D'Epi Bread](http://www.bakingforfriends.com/rain-deli-bread/)** (aka Wheat Stalk Bread) is a twist on the classic French baguette that is sure to impress! From **Baking For Friends**. When it's your grandma's most sought after recipe, you know you have to master this **[Brown Molasses Bread](http://www.youcaneatnow.com/molasses-bread/)**! From **You Can Eat Now**. Not all breads have to be yeasted. Roti is an Indian flatbread that dates back over 4000 years and cooked on the stovetop. From** Conifères & Feuillus**. Focaccia, an Italian flatbread is easy to make at home - especially if bread makes you a little nervous. Try this **[Easy Focaccia Bread](http://www.bitememore.com/feedme/208/easy-focaccia-bread-with-creamy-roasted-red-pepper-dip)** recipe to get started. From **Bite Me More**. With five types of seeds, two whole grains and one pulse in them, these **[Super Seed buns](http://www.nutritionnaire.com/recipe/super-seed-buns/)** are a protein packed powerhouses! From **Nutritionnaire**. Bring a swirl of purple to your day with this beautiful **[Purple Yam Bread](https://tinysweettooth.com/2017/03/24/purple-yam-bread/)**. From **Tiny Sweet Tooth**. A big thank you to all our FBC Members who participated in this week's bread roundup! I am definitely goign to find inspiration with this recipe selction. Just shared now, never got the email it was out.